Hey Guys! Welcome you onboard. The above calculator is an instant Kelvin to Celsius Converter. You can put any value in Kelvin scale and get Celsius value in return in a single click. Celsius and Kelvin’s scales are mostly used in the manifestation of temperature intervals and temperature magnitudes. Converting values from one scale to another doesn’t belittle any scale but help you anticipate temperature values using more than one options. These scales don’t share common starting point and require some offset to added at the start to make them equal. If you intend to convert any value from one scale to another, you must know the formula behind doing that calculation that help understand the conversion rate. Following formula is used for Kelvin to Celsius conversion. The C represents Celsius and K represents Kelvin. What is the value of 70 K in Celsius? 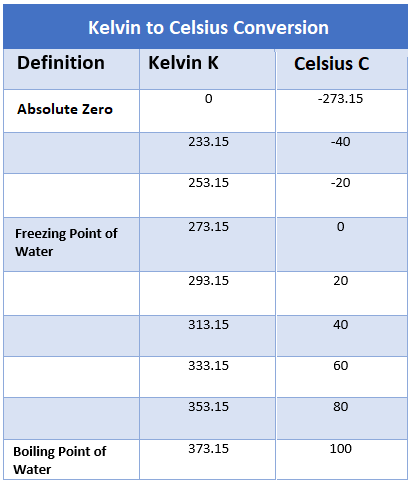 Following table shows some common values used for Kelvin to Celsius conversion. Kelvin is a thermodynamic temperature scale, denoted by K and is based on Absolute Zero which is known as the temperature at which all thermal motions seize to flow. It is important to note that, the Kelvin scale is not written in terms of degree, unlike Fahrenheit and Celsius that are written with a degree sign. The Kelvin scale shows the absolute value while the other two temperature scales come up with arbitrary values. In the start, the Kelvin scale was written with degree sign, which was later omitted in order to create the candid difference between Rankine and Kelvin scale, as some people perceived K with degree sign as a Rankine temperature. The Celsius is an SI unit of temperature that is defined in terms of Kelvin, terming -273.15 Celsius equal to the 0 K – commonly known as the Absolute zero. Until 1954, the Celsius was defined as per the freezing and boiling point of water where it freezes at 0 ºC and boils at 100 ºC. The Celsius scale was named after Swedish Astronomer Anders Celsius. Before naming this scale as Celsius in 1948, it was written as centigrade – A Latin word comes up with two parts where centum means 100 and gradus means steps. Most of the content related to science and technology is produced using both temperature scales where temperature intervals are expressed in Celsius and an Absolute temperature are described in Kelvin. That’s all for today. I hope you have found this read informative as per your technical needs and demands. If you are feeling skeptical or have any question, you can approach me in the comment section below. I’d love to help you in any way I can, according to the best of my knowledge. Feel free to feed us with your valuable suggestions, so we keep producing quality content and you keep visiting this site every now and then. Thanks for reading the article. He is a blogger and technical writer who loves to explore new things out of curiosity. He believes in consistent hard work, honesty, and passion that are essential ingredients to unlock the ultimate success. He doesn't brag about his writing skills, but his excellence does.